Perfect for calming your dog in stressful situations such as socialization, travel, and kennels. Use a synthetic copy of a dog appeasing pheromone to elicit a calming message to your dog in a natural manner. 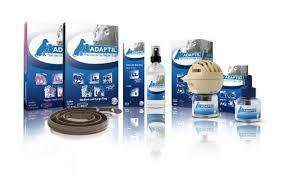 Adaptil plug in covers an area of 530-750 square feet with each vial and lasts up to 4 weeks. It's the secret to happy dogs!Adaptil is scientifically proven to calm dogs naturally using synthetic DAP, a pheromone released by the mother dog 3-5 days after having a litter of puppies.he Adaptil products is a natural product proven to comfort both puppies and adult dogs using a discreet plug-in, spray, or collar. Results as fast as 7 days. 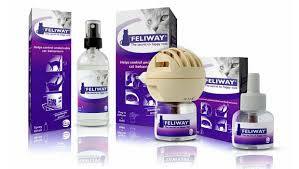 The Feliway Classic Starter Kit is clinically proven to help reduce spraying, scratching, hiding and other stress-related behaviors. This product calms and comforts your cat by mimicking natural feline pheromones. Composure™ chews for cats and dogs are a calming supplement designed to promote relaxation during stressful situations. Three main ingredients work together to support relaxation without affecting your furry friend's energy levels or personality. The Colostrum Calming Complex™ BiopeptideBlend supports stress reduction and cognitive function; L-Theanine helps the body produce other amino acids to bring specific neurotransmitters back into balance; and B vitamins (thiamine) affect the central nervous system to help calm anxious animals. No herbals used. It can be used daily or when extra help to relax is needed. The HALTI OptiFit is a premium headcollar designed to provide an optimum fit and which guarantees to stop your dog pulling. Its unique design works by gently directing the dogs head, steering him into desired positions just like a horse. The pack includes a HALTI OptiFit Headcollar, a comprehensive Training DVD and Guide and a HALTI safety link which connects to the dogs’ collar for extra security. With a self-adjusting chin strap and unique, reflective cheek straps which follow the contours of a dogs face, the OptiFit doesn’t rise into the dogs eyes or slide down to his lips (flews). The OptiFit provides maximum comfort and optimum fit no matter what shape or size.